This year, Little Spaghetti told me he wanted to be an orange robot for Halloween. I told him we could make that happen, and we did. Well...I did. I let him pick out the fabric, and I did the rest. I'll just share pictures because that's way cooler than anything else I could write about it. There will be a DIY tutorial for this costume...sometime. Soon hopefully. We like books. In fact, Little Spaghetti likes books so much that even when we go to playgroups with lots of kids and toys and running and screaming, he often sits in the corner and reads books. But too much reading will never be considered a problem in this house. We bring books everywhere. The problem with books is that they're heavy. And sort of big and clunky. Especially board books for toddlers. I've found that books are particularly big and clunky when you're trying to pack for a ten-day vacation to the Caribbean with a toddler using only carry-on luggage. Let's be honest: I'm way too cheap to check bags. But when we went to Barbados this summer, I knew we couldn't go without reading material. Then, I remembered my copy of Highlights Hello that I'd gotten at their launch party when I'd gone to BlogHer in August. You've probably seen Highlights magazine in a doctor's office somewhere. Or maybe a classroom. I never had a subscription to the magazine as a kid, but I know I read it a lot. I was in braces for more than four years of my life, so I spent many hours in waiting rooms. Highlights Hello is Highlights for babies, ages 0-2 to be specific. I tossed our copy into Little Spaghetti's backpack o' toys and took it on the plane to Barbados with us. It was the only "book" we brought with us, and thank goodness we did. We read it every night before bedtime. 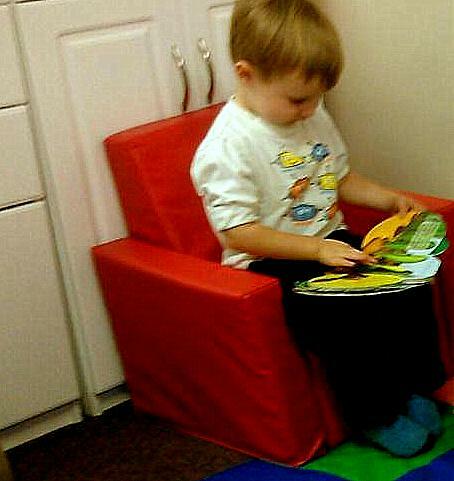 Throughout the day, he would pull it out to read it to himself. We even read it on the beach. It turns out that even turquoise water and white sand beaches are better when you've got something to read. The magazine has a story, poems, colorful images, and little tips on some of the pages for parents (or whoever's reading) about how to engage your kids. My favorite is the "Find It" section that's a toddler's version of Highlights' famous Hidden Pictures. The Highlights Hello pages are coated so they're waterproof (but also non-toxic). The binding is sewn, so it can withstand a lot of bending and cramming. So far, it's been pretty indestructible. Rumor is you can even put it in the washing machine, though I haven't tried that out...yet. It's perfect to keep in a purse or diaper bag to pull out whenever you find yourself waiting somewhere because it's light, sturdy, and doesn't take up much space. And, I can't end this post without saying something about Highlights as a company. I mentioned the launch party in New York City that I was lucky enough to attend when I went to BlogHer in August. If you're not familiar with BlogHer, you should know that there are a lot of parties at and around the conference. A lot. The Highlights party was different, though - no swanky location, no fancy gourmet chefs, no swag, no celebrity appearances, and nothing about it was over-the-top. Yet, it was probably my favorite of all the events I attended during my time at BlogHer. Why? It's simple. I talked to three Highlights representatives, and all of them had read my blog. They'd read enough of it so that they could talk to me about my son (and they complimented my writing; flattery never gets old!). The PR representatives actually worked at Highlights, so they could answer all of my questions and were passionate about what they did. They had a genuine interest in working with bloggers and becoming part of the blogging community. And, their products focus on writing, which is what blogging is all about after all. Even though the event was three months ago, it's the one thing I haven't been able to forget that I wanted to blog about. (One of these days I'll do an actual BlogHer recap post about all of the awesome people and great brands I met. Better late than never, right?) I loved meeting the Highlights folks, and I came away an even bigger believer in their magazine and their company. I can safely say that Highlights is something I can't wait to continue to share with my son. We're headed into the next stage of Highlights magazines: High Five (ages 2-6), which Little Spaghetti has really started enjoying. But if we have another baby, you can bet I'll be adding more Highlights Hellos to our collection, too. I wasn't compensated for this post, but I did get a free breakfast at the Highlights Hello launch party, free copies of their magazines to check out, and a free one-year subscription. I also met some really cool Highlights employees, but I'm probably not required to disclose that. It's finally time! Who wants to win $100?? You know, if I had the money, I would give each of my readers $100 cash just for fun. Sadly, I don't see that happening any time soon. So, the next best thing I can do is at least give you guys a chance to win a hundred bucks. Our lovely host are The Spaghetti Westerner (that's me! 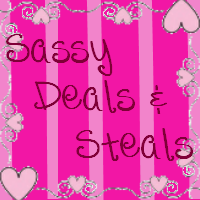 ), Stay a Stay at Home Mom, The Bunny's Review , The Guavalicious Life, and K is for Kechell. For fairness sake, we will be evaluating all the entries - anyone that uses multiple entries from one ip address will be disqualified from the giveaway. Only ONE ip per household is allowed. Disclosure: I was not compensated for this publication. All views are my own and may differ to than that of yours. The Spaghetti Westerner is not responsible for the prize fulfillment. A while back I had an awesome train birthday party for a very special Little Spaghetti when he turned two. One of the highlights (for me, at least) was the train I made for him to ride in out of a plain ol' garden cart. You know when you do something that just makes you feel so clever? This was definitely one of those projects. I felt like a genius. And now you can, too. (I'll even let you take the credit from your awed party guests). I have thought of so many other things I can transform this cart into: a car, a submarine, a sleigh for Christmastime. The possibilities are endless. 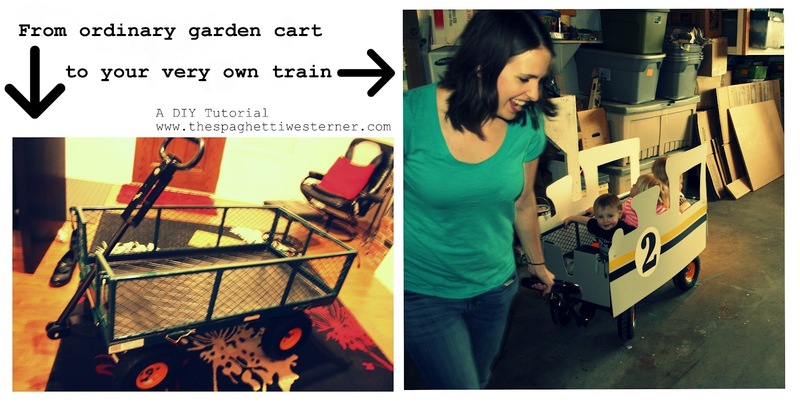 First, you need a garden cart. This is ours. It's metal, and the wheels happened to be yellow which happened to match the gray, black and yellow color scheme of the train party perfectly. I'm pretty sure ours came from one of the big box home improvement stores...the one with the orange logo that rhymes with Home Shmepot. Anyway, the sides aren't solid; they're sort of a metal mesh. Next, you need your train sides. I stalk frequent Craigslist and happened to pick up a whole stack of mat boards from a frame shop that was doing some spring cleaning. Mat boards are the cardboardy things that go around pictures when you frame them. They're sturdy and colored, which was perfect for this project. You could probably also use cardboard or foam core, and then paint them whatever color you like. My mat boards were 32" by 40". If you must have mat boards, try somewhere like Aaron Brothers or Michaels. I free-handed my train shapes. I practiced on a piece of cardboard. Then, when I had a shape I liked, I traced it onto the back of the mat board. Cutting this sucker out was not fun...but it was well worth it. I used a combination of scissors, a box cutter, and sheer, brute strength. The tight corners in the windows and around the stack were a pain in the behind. Just don't say I didn't warn you. Or curse me when you're at your lowest, whatever - just persevere. I originally thought about gluing ribbon to the side of my train, but then I saw the colored Duck tape, and it seemed like a way easier solution. A yellow stripe and a black stripe down each side, and I had what I wanted. Then I printed out a number "2" (since it was Little Spaghetti's second birthday and all. Really original, I know). I cut an oval around each number and glued them on the train sides over the stripes. See? Pretty darn self-explanatory, but I took a picture anyway. Then came the tricky part: Attaching the sides to the train. I wanted to be able to remove them without ruining them so I could put them back on if I wanted to, but also use the garden cart for hauling dirt and rocks and other gardening things. So I decided to use those. I cut slits in the side of the train, then wrapped the velcro strips through each set of slits. Then, I wrapped the velcro through the mesh sides of the cart. Sorry I don't have a better visual, but I hope it makes sense. I put two velcro strips on each side, near the top corners of the cart sides, to hold the whole thing in place. When you're mounting your sides, be sure they're high enough not to get in the way of the wheels when you turn the cart. You could probably also use zip ties or string. If your cart has solid sides, you might try some of that super sticky velcro they sell for hanging up pictures: Just stick one side of it to the cart and the other to the train? I don't know, but I bet you can come up with something. I also made gray panels out of the leftover mat board for the front and back of the cart. Just be sure to cut space for your wagon handle so you can still drive the cart. And that's it! I sewed up a couple of big, long pillows to put in the cart for the kids to sit on so they didn't have to lean against the metal cart, but it was probably overkill. Little Spaghetti was so excited to see his very own train. Finally, get your sister (or other unsuspecting relative) to offer to help with, "whatever you need for the birthday party," and assign that person the job of pulling the train. We were going to have train rides outside, but it was raining. The kids didn't seem to mind being in the garage. And that birthday boy's smile is all I need to call this one a success! Did you make one? Make sure you send me a picture; I want to see your garden cart in action.